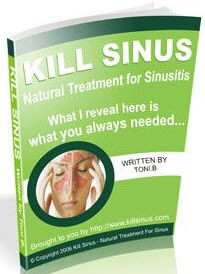 In deciding on appropriate therapy, the first step is to differentiate bacterial sinusitis from nasal congestion accompanying viral upper respiratory tract disease. 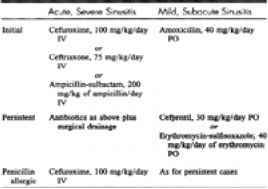 Although the latter resolves spontaneously or may be treated with decongestants, sinusitis requires therapy with antibiotics ( Table 117.-.6.). Mild, subacute infections respond well to oral therapy for 10 to 14 days; as for otitis media, amoxicillin (40 mg/kg/day) remains the first-choice antimicrobial ( Fig 1J7.-2.). Failure to improve with amoxicillin therapy suggests infection with pathogens that are often resistant to this drug, such as M. catarrhalis or H. influenzae, or perhaps with penicillin-resistant S. pneumoniae. A second course of treatment with erythromycin/sulfisoxazole, newer oral second and third generation cephalosporins such as cefprozil or cefpodoxime, or amoxicillin-clavulanic acid should then be instituted; aspiration for culture may be useful for those patients in whom the infection still persists after a second course of therapy. FIG. 117-2. Approach to sinusitis in the immunocompetent child. Acute, severe sinusitis may result in life-threatening complications and requires intravenous antibiotic therapy directed at S. pneumoniae, amoxicillin-resistant H. influenzae, and less commonly S. aureus. Cefuroxime (100 mg/kg/day) and ceftriaxone (75 mg/kg/day) represent single-drug regimens effective for this disease; ampicillin-sulbactam (200 mg/kg/day) is an alternative for the nonallergic patient. 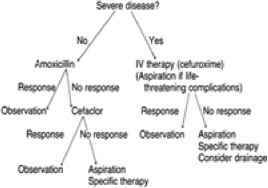 Failure of severe disease to respond promptly to antibiotic therapy or the occurrence of complications indicates the need for surgical consultation in regard to drainage procedures.